This book contains the correspondence between two German soldiers during World War I: Eugen Rosenstock, a logistics officer on the western front, and Franz Rosenzweig, serving in an antiaircraft outfit in Macedonia. 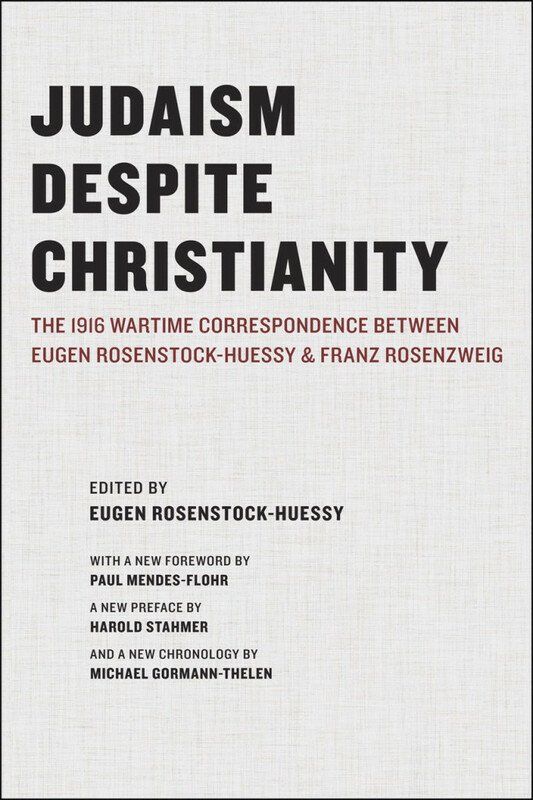 The correspondence is both sequel to and fruit of a long conversation the two men had had with Rosenzweig’s Christian cousin Rudolf Ehrenberg three years before, on the eve of Rosenstock’s 25th birthday. In July of 1913, Rosenstock’s declaration of simple Christian faith had upended Rosenzweig’s understanding of what religion was. In three months of struggle, he prepared himself to join in Rosenstock’s acceptance of Christianity but, profoundly moved by the Yom Kippur services that fall, decided that while he would accept revelation on Rosenstock’s terms, he would also remain a Jew, if not become a Jew for the first time. Ehrenberg was witness to his cousin’s turmoil and knew of its result, but not until three years had passed did he tell Rosenstock and urge him to write his friend. Often portrayed as an attempt by Rosenstock to convert his friend, the correspondence is in fact a no-holds-barred discussion that roots in Rosenstock’s acceptance of Rosenzweig’s decision to become a Jew. (Paul Mendes-Flohr has pointed out that both men were converts from the paganism prevalent in academe.) Although they could unite in the affirming that “revelation was orientation,” they found that their opposing views only became more pronounced in the course of the correspondence; the exchange defined both men for the rest of their lives. This revised and expanded edition of Judaism Despite Christianity contains the complete text of the 1969 English-language first edition, together with a new introduction by Paul Mendes-Flohr, a new preface by Harold Stahmer, a chronology of Rosenstock-Huessy’s work by Michael Gormann Thelen. University of Chicago Press, 2011. Paperback, 181 pages.